The Tomatin Distillery Co Ltd is celebrating a win at the World Whiskies Design Awards 2014. Its newest single malt brand, Cù Bòcan Highland Single Malt Scotch Whisky, was awarded the ‘Best New Launch’ award. The World Whiskies Design Awards are the annual awards recognising excellence in bottle, label and pack design. Judged by an international panel of design experts, the winners were announced on Thursday 20th March 2013 at the Whisky Magazine’s Awards Presentation Dinner held at the Waldorf Hilton in London. The World Whiskies Awards were also announced, in which the Tomatin 18 year old single malt won “Best Highland Single Malt 13 to 20 Years” for the second year running. 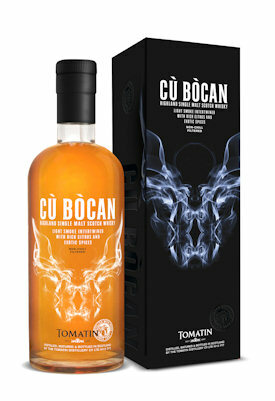 Released in September 2013, Cù Bòcan is a departure from the traditional Tomatin range, both in flavour - it is lightly peated - and in its contemporary presentation. Cù Bòcan (loosely translating from Gaelic as “ghost dog”) tells the story of a legendary hellhound who has been stalking residents of Tomatin for centuries, expertly portrayed by its innovative and eerie packaging.